Huddersfield moved out of the Championship relegation places with a fine win at Birmingham as David Wagner picked up his first victory in charge. Birmingham started the day in sixth place but the visitors went ahead after 31 seconds when Joe Lolley buried Sean Scannell's cross. 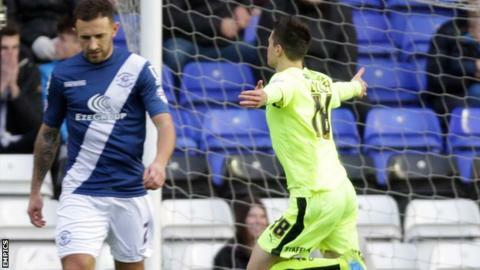 The Blues came close to an equaliser when on-loan Arsenal midfielder Jon Toral had an effort saved by Jed Steer. Huddersfield sealed it when Nahki Wells converted another Scannell cross. The Terriers had not won in six games but are now up to 19th place in the Championship, while Gary Rowett's side have slipped to seventh - just outside the play-offs. After Lolley had given Huddersfield a dream start with his first goal since April, the home side struggled to offer any attacking threat apart from a long-range shot from Demarai Gray. Birmingham's lone forward Nicolai Brock-Madsen failed to connect with a low David Davis cross before Wells wrapped up the win after more good work from Scannell. The Blues have now won just one of their last six league games at home. "They have been told to report on Monday. I am not going to enjoy the weekend and I see no reason why they should. "We look a little short of confidence and ruthlessness in the way we defend and take chances. "At the moment you can say the lack of resources is the reason for recent performances but all clubs are feeling the pressure. "For us we are showing the lack of quality in the depth of our squad. We always knew that was going to be an issue but we have to dig in and kick on. "We are having a little bit of blip and lacking a little lack of confidence. We have to crack on with what we have got." "It was the perfect performance. We started as we finished the previous game and this is a good sign. "To be honest, I expected a good game. We are very happy and proud about our performance and the result. "I am pleased with the performance of the squad and we made a perfect start with such a quick goal. "I am sure this squad has quality to enjoy a good position by the end of the season. The win is another step in the right direction." Match ends, Birmingham City 0, Huddersfield Town 2. Second Half ends, Birmingham City 0, Huddersfield Town 2. Corner, Birmingham City. Conceded by Martin Cranie. Offside, Huddersfield Town. Mustapha Carayol tries a through ball, but Ishmael Miller is caught offside. Attempt missed. Jacques Maghoma (Birmingham City) right footed shot from the right side of the box is close, but misses to the right. Assisted by Andrew Shinnie. Corner, Birmingham City. Conceded by Ben Chilwell. Jed Steer (Huddersfield Town) wins a free kick in the defensive half. Substitution, Huddersfield Town. Ishmael Miller replaces Nahki Wells. Andrew Shinnie (Birmingham City) wins a free kick on the right wing. Corner, Huddersfield Town. Conceded by Michael Morrison. Attempt blocked. Jamie Paterson (Huddersfield Town) right footed shot from the centre of the box is blocked. Assisted by Mustapha Carayol. Goal! Birmingham City 0, Huddersfield Town 2. Nahki Wells (Huddersfield Town) right footed shot from very close range to the bottom left corner. Assisted by Sean Scannell. Foul by Emyr Huws (Huddersfield Town). Attempt saved. Jon-Miquel Toral (Birmingham City) right footed shot from the centre of the box is saved in the bottom left corner. Assisted by Jonathan Spector. Corner, Huddersfield Town. Conceded by Jonathan Spector. Mustapha Carayol (Huddersfield Town) is shown the yellow card for a bad foul. Substitution, Birmingham City. Andrew Shinnie replaces Demarai Gray. Substitution, Huddersfield Town. Kyle Dempsey replaces Dean Whitehead because of an injury. Delay in match Dean Whitehead (Huddersfield Town) because of an injury. Offside, Birmingham City. Jon-Miquel Toral tries a through ball, but Jacques Maghoma is caught offside.